Grace United Methodist Church in Gallipolis donated gift bags to local law enforcement in anticipation of Law Enforcement Appreciation Week. From left are Pastor Ray Kane, Sheriff Matt Champlin, Becca Loscar, and Marlene Stout. GALLIPOLIS — Grace United Methodist Church recently showed appreciation for local law enforcement appreciation week, which falls on the week of May 15, annually. Members of the church gathered together and prepared gift bags for every peace officer on active duty in Gallia County and hand delivered them to each agency: Ohio State Highway Patrol, Gallipolis Police Department, Rio Grande Police Department, and Gallia County Sheriff’s Office. “We’re doing it because it is a good cause. Our police officers are being used as target practice and we want to let them know that we love them and we look out for them too, because they look out for us,”said Becca Loscar. 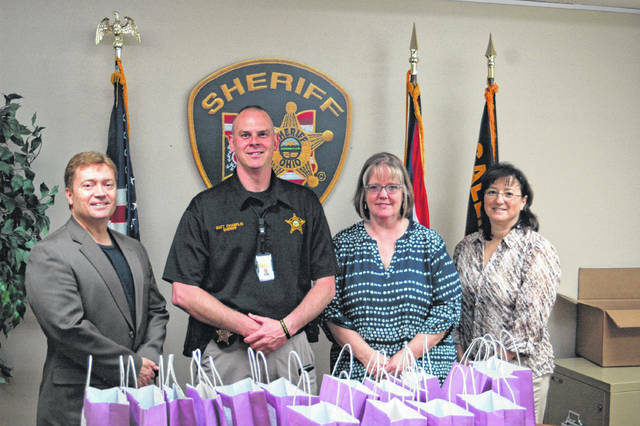 On Wednesday church members gave out 32 gift bags to the Gallipolis Police Department and the Sheriff’s Office, with plans to visit other law enforcement agencies in Gallia in the coming days. “We appreciate them thinking about us, we don’t expect that out of anybody but we really appreciate them doing it for us,” said GPD Chief Jeff Boyer. Each bag contained numerous items with meaning or a reminder. Each bag contained a Bible, stating the best directions come from God, smarties to give wisdom to make the right decisions, paper clips to help them hold it together, marbles to replace the ones they have lost, and more. “I’m very appreciative of the Methodist Church taking the time and effort to show their appreciation to our staff. The support and communication that our law enforcement community is receiving from the citizens we serve is greatly appreciated and is paying dividends on our fight against crime,” said Gallia Sheriff Matt Champlin.